Download our leasing guide to learn about the different lease types available. 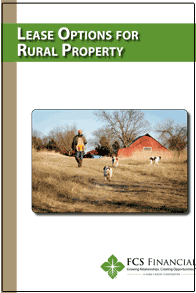 Download this guide to explore the different types of leases available for rural property. We understand not everyone wants to actively farm but you may want to live in the country for the agricultural lifestyle. Leasing rural property for hunting, agricultural production or even your buildings is an avenue that provides an income stream and involvement in agriculture but with limited cash output.